Inflammation is a pathological feature of the pancreatic islet in type 1 and 2 diabetes, contributing to islet endocrine cell failure and the onset of hyperglycaemia in both diseases. Indeed, numerous immune targets have recently been found to be altered in type 2 diabetes, but few have yet to be translated to the clinic. Taylor-Fishwick and colleagues aimed to change this by performing proof-of-concept studies investigating the efficacy of small molecule inhibitors of 12-lipoxygenase in rodent and human beta cells exposed to proinflammatory cytokines. 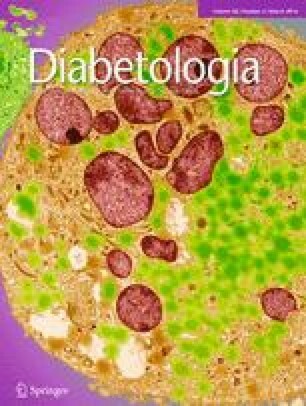 The results of these studies, published in this issue of Diabetologia (DOI: 10.1007/s00125-014-3452-0), build on a wealth of preclinical data that have implicated 12-lipoxygenase in rodent models of type 1 and 2 diabetes. While there remain some unanswered mechanistic questions regarding how cytokines regulate 12-lipoxygenase activation and the downstream consequences of activation, it is hoped that future studies with newly identified selective inhibitors may overcome the in vitro limitations of this study and allow for the eventual clinical translation of these highly interesting findings. In addition to the increasing worldwide incidence of diabetes, the classical definitions of type 1 and 2 diabetes are beginning to blur. Classical type 1 diabetes is due to autoimmune attack of the insulin-producing pancreatic beta cell, while type 2 diabetes occurs when pancreatic beta cells fail in the face of insulin resistance . The former is typically juvenile onset, and the latter is most frequently associated with obesity. However, type 1 diabetes is being increasingly diagnosed among adults, and obesity is increasing the incidence of type 2 diabetes among adolescents . Both types of diabetes are clinically diagnosed by the onset of hyperglycaemia, with treatment typically beginning with insulin therapy for type 1 diabetes, while type 2 diabetes is initially treated with improved nutrition, exercise and metformin. Understanding that beta cells are already defective at the onset of type 2 diabetes has also promoted insulin treatment at earlier stages of the disease . It has long been appreciated that inflammation is central to the pathology of the pancreatic islet in type 1 diabetes [4, 5]. However, recent evidence indicates that inflammation is also a contributor to pancreatic beta and alpha cell failure in type 2 diabetes, with IL-1 and glycoprotein 130 (gp130) receptor cytokines playing prominent roles in these two endocrine cell types, respectively [6, 7, 8]. We now know that islet inflammation may be triggered by a combination of inflammasome activation, Toll-like receptor 2 and 4 ligands including NEFA, bacterial wall products [9, 10], and islet amyloid polypeptide deposits , as well as endocannabinoid , and that human islet pathology is characterised by increased numbers of macrophages, CD20+ B cells and, potentially, T cells . In addition to islet-localised inflammation in type 2 diabetes, inflammation also impacts insulin target tissues in this disease, including the liver and adipose tissue, increasing insulin resistance and putting further stress on pancreatic endocrine cells . Secondary vascular complications associated with type 2 diabetes (e.g. micro- and macrovascular complications) are also driven by an inflammatory process . In fact, endogenous pathogen-associated molecular patterns and danger-associated molecular patterns appear to be systemically elevated in type 2 diabetes, driving a heightened proinflammatory state in circulating monocytes and monocyte-derived macrophages from individuals with this disease . Thus, a strong case can be made that targeting inflammation may not only reduce glycaemia in diabetes, but also improve numerous disease-associated sequelae. This presents a therapeutic opportunity for developing anti-inflammatory drugs specific to the pathology of type 2 diabetes. While some therapeutics currently on the market to treat type 2 diabetes have secondary anti-inflammatory effects , none is specifically directed at immune molecules. This has prompted recent clinical trials investigating novel anti-inflammatory drugs in type 2 diabetes with anti-IL-1β, salsalate and anti-TNFα being the most advanced . However, these immune targets are not the only pathways altered in individuals with type 2 diabetes, and evidence for many others is beginning to emerge. Therefore, it can be said that there is a dearth of novel therapeutics targeting the multiple aberrant immune responses in this condition. Lipoxygenases are members of a family of enzymes involved in the synthesis of eicosanoids from arachidonic acid and related polyunsaturated fatty acids . These eicosanoids, which are oxygenated derivatives of 20-carbon fatty acids, include leukotrienes, lipoxins, hepoxilins, eoxins, resolvins, protectins and others . Eicosanoids are important regulators of numerous systems in the human body, including growth after physical activity, inflammation or immunity, and messengers in the central nervous system. Lipoxygenases are implicated in various inflammatory diseases, including cancer, heart disease, asthma and diabetes . Indeed, Nadler and colleagues, and others, have been investigating the role of leucocyte 12-lipoxygenase in diabetes since the mid-1990s [18, 19]. 12-Lipoxygenase peroxidates polyunsaturated fatty acids, including arachidonic acid and linoleic acid to generate lipid inflammatory mediators, such as 12-hydroperoxyeicosatetraenoic acid and 12-hydroxyeicosatetraenoic acid (12-HETE). However, the discovery of selective, potent inhibitors of 12-lipoxygenase has remained elusive. This prompted a large study that used quantitative high-throughput screening to identify selective inhibitors among a library of 153,607 compounds . Several compounds were identified as exhibiting excellent specificity, >50-fold selectivity vs the paralogues 5-human lipoxygenase, reticulocyte 15-human lipoxygenase type-1 and epithelial 15-human lipoxygenase type 2, and >100-fold selectivity vs ovine cyclooxygenase-1 and human cyclooxygenase-2 . With these tools in hand, Taylor-Fishwick and colleagues  set out to perform a proof-of-concept study investigating the efficacy of these small molecule inhibitors in rodent and human beta cells exposed to proinflammatory cytokines increased locally within islets in diabetes. Using two specific 12-lipoxygenase inhibitors, Compounds 5 and 9, the authors performed experiments designed to demonstrate the ability of these compounds to inhibit 12-HETE production in human islets and rodent beta cell lines in vitro. Compounds 5 and 9 were both effective in preventing the detrimental effects of IL-1β, TNFα and IFNγ on glucose-stimulated insulin secretion in human islets and rodent beta cell lines. Compounds 5 and 9 also partially protected rodent beta cell lines, non-diabetic NOD mouse islets, and human islets from the pro-apoptotic effects of IL-1β, TNFα, and IFNγ, while in parallel, blunting islet mRNA expression of MCP1 (also known as CCL2) and IL-12p40. Finally, Compound 5 also showed acute systemic efficacy in vivo, reducing plasma 12-HETE levels by over 60%, with a calculated half life of 2.72 h following an oral bolus administration of 50 mg/kg. Indeed, an impressive body of preclinical studies supports the clinical development of 12-lipoxygenase inhibitors for the treatment of diabetes. This includes studies showing that mice with knockout of the 12-lipoxygenase gene (Alox12) were protected from multiple low-dose streptozotocin-induced diabetes and from diabetes development on the NOD background [19, 22]. Germline Alox12 knockout mice were also protected from high-fat-diet-induced glucose intolerance  and insulin resistance . Systemic deletion of 12-lipoxygenase appeared to have no effect on glucose homeostasis or islet development in the absence of diabetes-inducing stressors, suggesting therapeutic targeting of this molecule would have minimal adverse effects [19, 23, 24]. To address the tissue-specific actions of 12-lipoxygenase, both adipocyte and pancreatic-specific Alox12 knockout mice were developed [25, 26]. Deletion of 12-lipoxygenase from either tissue protected from high-fat-diet-induced glucose intolerance [25, 26], while pancreatic 12-lipoxygenase deletion also protected from multiple low dose streptozotocin-induced diabetes . The benefit of studying tissue-specific deletion of genes is that it allows for more targeted studies on the actions of a given molecule in a specific cell type (e.g. the pancreatic beta cell), while confirming its cell autonomous effects in vivo. At the molecular level, depletion of 12-lipoxygenase in islets was found to increase the ability of beta cells to handle oxidative stress, by upregulating the transcription factor nuclear factor-like 2 (NRF2) . This resulted in increased islet antioxidant enzymes, superoxide dismutase 1 (SOD1) and glutathione peroxidase 1 (GPX1), in response to high-fat-diet feeding . Together with previous studies on human islets , these data suggest that clinical application of recently identified 12-lipoxygenase inhibitors may help preserve islet cell function during impaired glucose tolerance or in established type 2 diabetes. Unfortunately, a limitation of the study by Taylor-Fishwick and colleagues is the lack of in vivo translation of their newly discovered 12-lipoxygenase inhibitors for the treatment of rodent models of diabetes. The authors report that achieving parenteral formulations of their compounds to perform long-term proof-of-concept studies was limited because of a lack of aqueous solubility. We look forward to seeing this limitation overcome in future studies using a recently identified new chemical class of selective inhibitors . In addition to the in vivo translation of these studies, some future studies on the upstream and downstream molecular mechanisms definitively linking diabetes to 12-lipoxygenase activation in beta cells and alpha cells are warranted (see Fig. 1). For example, is 12-lipoxygenase only activated in beta cells by proinflammatory cytokines, or do lipids, hyperglycaemia and amyloid deposits also stimulate eicosanoid production? What is the molecular mechanism linking these agents to 12-lipoxygenase activation? A recent report that inhibition of Ca2+-independent phospholipase A2 ameliorates islet infiltration and the incidence of diabetes in NOD mice provides an interesting upstream therapeutic target . How do 12-lipoxygenase products cause oxidative or endoplasmic reticulum stress in beta cells? Indeed, the recent identification of a potential 12-HETE receptor (G protein-coupled receptor 31; GPR31)  suggests activation via this G protein-coupled receptor could prove critical for transducing the effects of 12-lipoxygenase-derived 12-HETE in beta cells. Does 12-lipoxygenase regulate the membrane redox state in beta cells and thereby impair mitochondrial activity, or activate a redox-dependent cell death pathway as reported in other cell types? . It may also be interesting to consider non-beta cell cell types in the islet as contributors to local 12-HETE production (e.g. blood platelets and macrophages). Finally, since eicosanoids are essential molecules required during the classic inflammatory response and in the central nervous system, the benefits of 12-lipoxygenase inhibition will need to be weighed against any adverse effects. Interestingly, leucocyte 12-lipoxygenase expression may have initially been thought to be restricted to immune cells, but it clearly also plays a role in beta cell function and survival. Perhaps there are other molecular mechanisms in immune cells that are critical for islet endocrine cell function and vice versa. The emergence of the immunometabolism field should provide numerous answers to these questions in the years ahead, and hopefully provide insight into new therapies to treat diabetes. We thank all members of the Ehses and Donath laboratories for their insightful comments and feedback. Funding for work at the Ehses laboratory is provided by the Child & Family Research Institute, the University of British Columbia, the Canadian Foundation for Innovation, the Canadian Diabetes Association, and the Canadian Institutes of Health Research. Funding for work in the Donath laboratory is provided by the University Hospital Basel, the Swiss National Foundation and the Juvenile Diabetes Research Foundation. The authors have no duality of interest associated with this manuscript. JAE and MYD were responsible for the conception and design of the manuscript, drafting the article, revising it critically for important intellectual content, and approval of the version to be published.